Colds are annoying. On average, adults suffer from two to four colds a year. Symptoms tend to peak after two to three days but the cough that comes with a cold can last for three to four weeks. 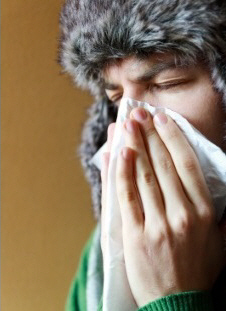 Colds are caused by viruses infecting your upper airways (nose, sinuses, mouth, throat, and voice box). They are not caused by bacteria, so antibiotics will not treat a cold. You can avoid colds by washing your hands before eating or preparing food, and not sharing cups, drink bottles, knives and forks, or anything you eat or drink with. Also wash your hands after you have touched your face. Cover your mouth and nose with a tissue or your arm (but not your hand) when you sneeze or cough, and then wash your hands afterwards. Keeping your home warm and dry, and being smokefree also help to stop you and your family from getting colds. Getting enough sleep and eating well can also reduce the number of colds you get, and how bad they are. Most people get over a cold within one to two weeks, but the cough that goes with a cold can last up to four weeks. 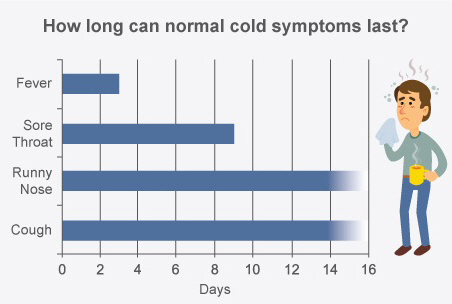 The image below shows how long cold symptoms can last – a cough and runny nose can continue past two weeks without being a serious problem. While your immune system is fighting the cold, any mucus you are coughing up may go from white or clear to yellow or pale green. This is normal. As long as it is just a small amount and you don't have any other chest symptoms, you don't need antibiotics. There are no treatments that will make a cold go away more quickly. But your immune system should fight it off within one or two weeks. Antibiotics will not treat a cold, and may cause side-effects such as diarrhoea (the runs), thrush, and tummy aches. Taking antibiotics when you don't need them makes it more likely you will later develop a bacterial infection that doesn't respond to antibiotics. It could then be very hard to find an antibiotic that works for you. Get lots of rest. You may feel pressure to be at work, but you will generally feel worse if you go in. You are also most likely to pass your cold to others during the first two to three days, so colleagues may thank you for staying away. Drink plenty of fluids. Your body may need more water if you have a fever. Being dehydrated will make you feel much worse, so drinking plenty of water can help. Paracetamol and ibuprofen. These can help to relieve fever, aches, sore throats, ear ache, and headaches. Carefully follow the instructions on the label about how much medicine you should take and how often you should take it. It is important not to take more than the maximum dose. Decongestants. These come as tablets or nasal sprays and can help with headaches and a blocked nose. However, you shouldn't use them for more than three to four days. Decongestants can cause side effects, such an irritated nose, a dry mouth, and headaches. Speak to a pharmacist before using a decongestant, especially if you are taking any other medicine. Steam inhalation. This may make congestion better for a while and does not have the same side effects as decongestants. Having a warm shower or bath before bed may also help, as can using a humidifier in your bedroom. Throat lozenges and sprays. These can help make a sore throat feel better, but they may not be any more effective than simple pain relief medicine like paracetamol and ibuprofen. There are lots of cold and flu medications available over the counter. Read the labels carefully, because they are often expensive versions of simple painkillers or decongestants. Speak to a pharmacist if you are not sure what to take or if you are taking other medication, especially if you have any other health condition or are pregnant, as it may be best that you don't take these medications. have had a wet-sounding cough for four weeks, or have had the cold for four weeks and aren't getting better. Seek medical help immediately if you have any symptoms of meningitis. This article summarises the evidence for and against various complementary treatment for colds.